Well if that didn't just consolidate these two episodes as one of Doctor Who's greatest ever two-parters then I don't know what would. Last week, with the stellar The Girl Who Died, the show offered us a giddy, fast paced, comedic romp in the Viking era that took a sharp left turn into some of the heaviest and most emotional sequences of the whole Moffat era for its final act. And now the show comes back seven days later and gives us this. The Woman Who Lived is a very different episode to the one that came before it, but it had to be. Set this time in 1651, the (sort of) concluding story was much darker, and much more focused on dialogue and thematic content than its predecessor. The Girl Who Died was solid but bog standard Doctor Who until its final act came along, this is something completely different entirely. And I think that's what has made this season such an absolute blast so far; everything just feels so fresh. The Woman Who Lived opens with a highwayman known as The Knightmare robbing a family at gunpoint. 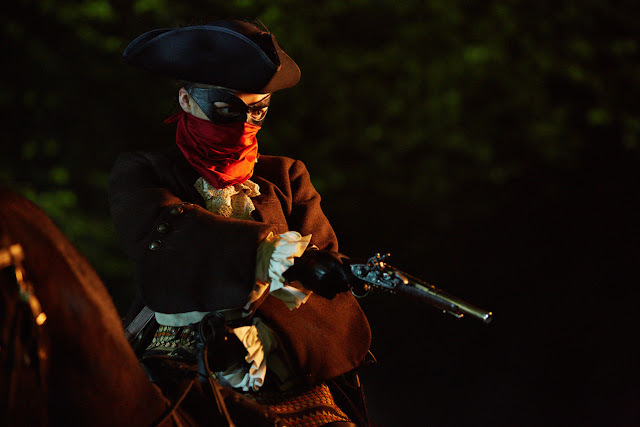 Sooner rather than later the Doctor stumbles in, oblivious to the fact that he has interrupted a robbery, and it's revealed that the Knightmare is Ashildr. Except it also isn't. The Doctor and not-Ashildr return to her house, and the whole first half of the episode is essentially constant dialogue between the pair, as they discuss and argue over what he has done to her by granting her immortality. A millennium has passed since we last saw Ashildr, and she barely remembers the events of that fateful day in her little Viking village. When the Doctor refers to her as Ashildr, she doesn't even register it as a name she previously went by. There are probably a hundred different ways you could deal with that scenario, but the way Me (as she now calls herself) shrugs that comment off with "If you say so" is possibly the most heartbreaking. She's been alive for so long now that she doesn't even register an emotional connection to the life she lived before the Doctor revived her. It's credit to Catherine Treganna's excellent script that none of the dialogue falls into the trap of overloading us with exposition. The purpose of these scenes aren't to fill in the gaps and catch us up on what Me has done since we last saw her as Ashildr, rather they act as a deep and thoughtful insight into her broken mindset and allow us to understand the emotional damage the Doctor has caused her. As Me rightfully points out, she is burdened with the curse of an eternal life coupled with the memory capacity of a regular human being. She cannot keep every memory she makes. As the Doctor flicks through one of Me's journals, he finds pages ripped out from when certain memories became too painful to bear, and stains from teardrops cover page after page after page. Perhaps this episode's most devastating moment comes when the Doctor realises that Me had three children, all of whom died while she never aged. She keeps this memory though, despite its unbearable pain, as a reminder to stop her from ever having children again and suffering this unimaginable fate a second time. The first half of this episode all takes place at night, with the darkened frame only illuminated by moonlight or a flickering candle. The dialogue is all beautifully effective - poetic, even, as Me tells the Doctor that "All these people, they're like smoke. They blow away in the wind." - but it becomes something truly special with the delicate visuals to match. Peter Capaldi was breathtakingly good in this episode. He gave an excellent performance last week, too, with his comedic side flourishing and then his emotional availability resonating at the end, but we saw a whole new side to his Doctor tonight. This series keeps pushing and pulling at the Doctor's character but in all the right ways. Last season the superb Listen - one of my favourite Doctor Who stories of all time - gave us a beautiful insight into the Doctor, and this season is refusing to shake that off. I feel as if I know the twelfth Doctor more than I knew nine, or ten, or eleven. The writing this season has been so strong, and coupled with Capaldi's excellent acting ability it's difficult to come away without deep understanding of just who this Doctor is. Maisie Williams also excelled tonight, topping her performance last week with a much darker, more sophisticated turn. As Ashildr, Williams got to be fun and light-hearted, the sweet child in a grim environment. But Me lacks any of this, and Williams doesn't let any of her previous incarnation through. She is so good at separating Me from Ashildr that this could almost have been an entirely different actress. Noticeably absent this week was Clara, who only really appeared in that brief TARDIS sequence at the episode's close. As much as I like Clara as a character, I'm quite pleased she was left out of this episode; there wasn't really anything for her to add. This episode was all about the Doctor and Me and how they both deal with the curse of a lifespan that long, and Clara would have just got in the way of how they talked to each other. It is interesting, though, that Me designated Clara as the Doctor's weakness. When you combine that with the Doctor's fearful, sorrowful gaze at Clara as she ends the episode with the line "I'm not going anywhere", the whole thing just becomes even more resonating. These two episodes have been more thematically powerful than anything this show has done in a very long time, in fact I might even say they're two of the strongest episodes Doctor Who has ever done when you look at their themes and ideas in isolation. They are both so emotionally powerful, but also so utterly human at the same time. Doctor Who flying through space can be a blast, but this show is at its best when it understands how human it really is. Look, I don't particularly like giving this many really high scores out in a row, but series 9 really hasn't yet offered us anything below that standard. This series seems content in churning out golden episode after golden episode, and if that's how it's going to be, that's how it's going to be. "How many have you lost, Doctor? How many Clara's?" Boy does Me know how to get inside the Doctor's head. Rufus Hound was also enjoyable as Sam Swift. He was mostly there for comedy support, but he nailed it. Me showing up on the photo on Clara's phone in that final scene was contrived, yes, but when it fit in so well with the episode's thematic content, the episode earns the right to be contrived. Seriously, much like last week, there is nothing here I can fault. We're now half way through this series, and the show hasn't offered any episode below a 9.0. I had a feeling before it started that this season could be something special, and that's exactly what it is.